One of Africa’s little-known safari gems, Uganda is a country with everything from tropical forests and volcanic peaks, to savanna plains, where you can go in search of Mountain Gorillas and tree-climbing Lions, Chimpanzees and savanna Elephants; and that is what this Great Apes Safari is all about! 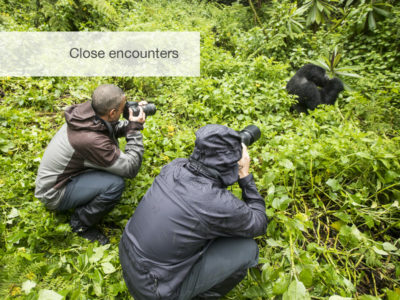 Your first stop is Kibale to trek for the Chimpanzees; a mostly forested national park, with spectacular scenery and prolific bird life, it also boasts twelve other species of primate, including the exotic Black-and-White Colobus Monkeys and the cute Red-tailed Monkey. 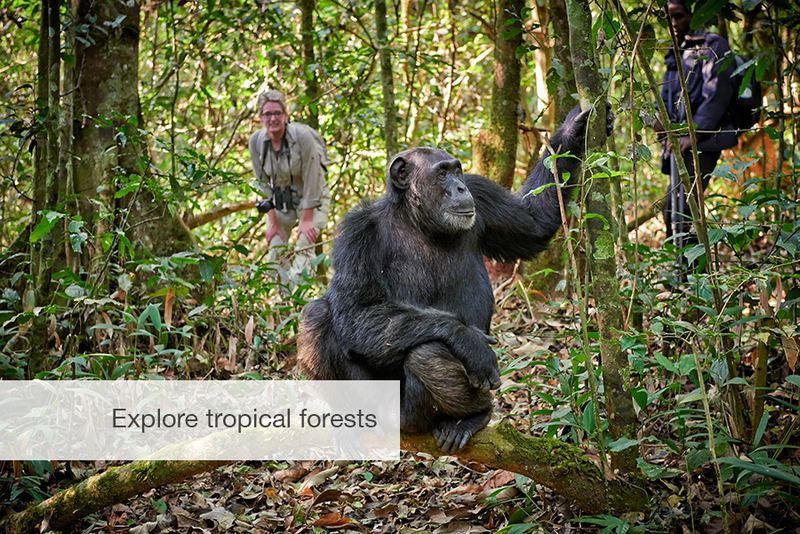 You will be part of an elite group of trekkers permitted to spend the entire day amongst a family of Chimps. 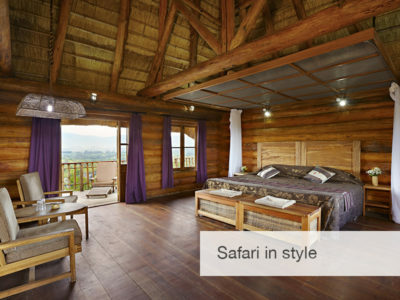 Set on the rim of a small crater, against the stunning backdrop of Lake Kyaninga and the snow capped Rwenzori Mountains beyond, this elegant and cosy lodge in Kibale consists of 9 exclusive cottages with sweeping views, superb dining and beautiful gardens. 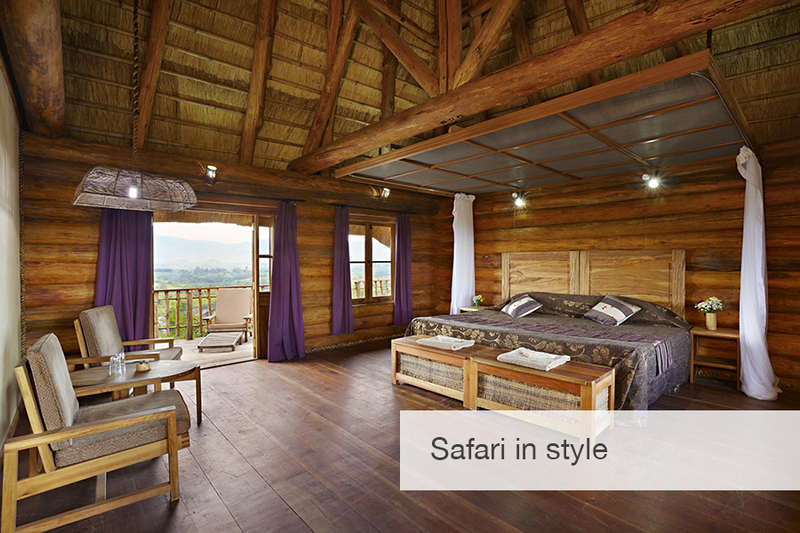 Your next destination is the Bwindi Impenetrable Forest, home of the magnificent Mountain Gorillas. But to get there you will take a leisurely safari drive through the beautiful savanna plains of Queen Elizabeth National Park in search of the famous tree-climbing Lions. 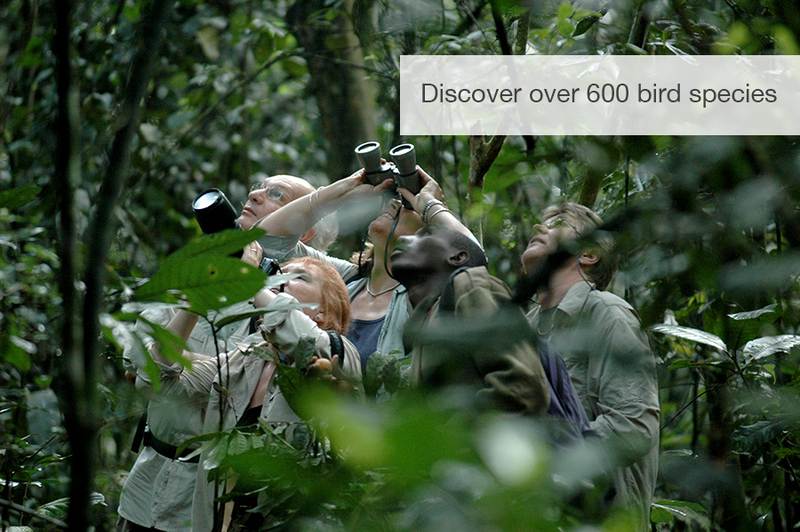 This wonderful park also boasts good sightings of Buffalo, Elephants, Ugandan Kob and over 600 species of birds! Arriving at the lodge in Bwindi Impenetrable Forest, you will be welcomed by friendly faces, a warm drink, and maybe even a family of gorillas that frequently pass through the camp! 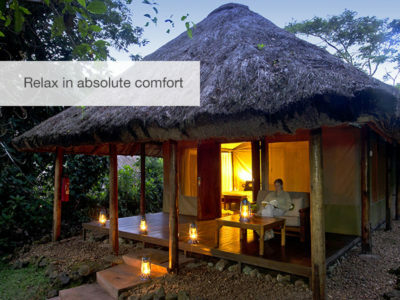 Trek through lush tropical forest and spend a sacred hour each day in the company of fully habituated Mountain Gorillas, who allow you to move quite freely amongst their family, observing their daily routine and interactions. Depending on the length of your gorilla trek, you may spend an afternoon visiting the Batwa Tribe, better known as the Pygmies. The Batwa are masters of the forest, and in many cases still live entirely off the land, using traditional methods. The gardens of your private lodge are a perfect place to enjoy the warmth of the camp fire and a relaxing cocktail after a good day’s trekking. Contact our safari specialists to help you plan your dream safari! Upon your arrival in Entebbe, you will be met by a local guide and transferred to your luxury hotel in Entebbe, set on a golf course overlooking Lake Victoria. 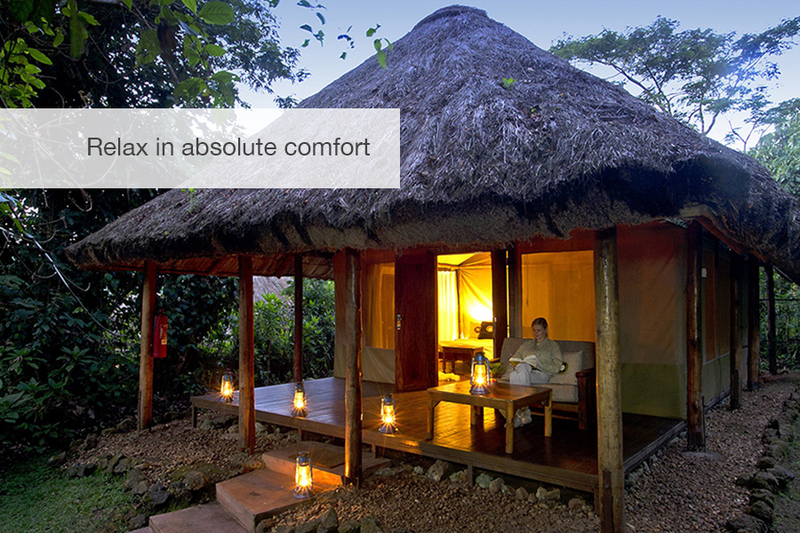 Relax and unwind as you prepare for your adventure through Uganda. 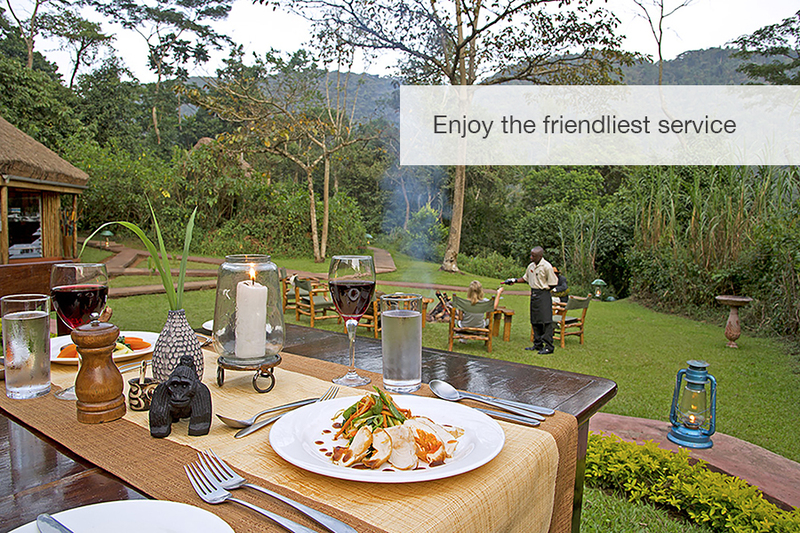 After a hearty breakfast, you head back to the airport in time for your charter flight to Kibale National Park. Your local guide will be waiting to greet you in Kibale, and take you on the scenic 1-hour drive through the forests to your lodge. 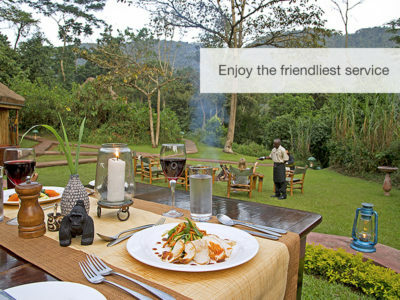 Settle in and explore the beautiful gardens and nearby surrounds, before enjoying sun-downers by the fire, with a stunning view of Lake Kyaninga and the snow-capped Rwenzori Mountains beyond. Waking up at dawn with tea and coffee, you will make your way down to the park headquarters where the chimpanzee treks begin. 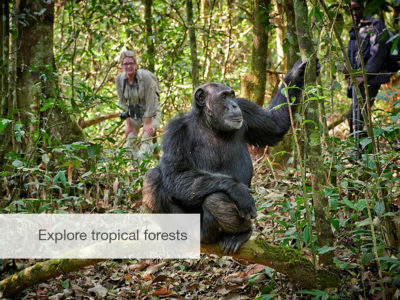 You will be part of an elite group of trekkers permitted to spend the entire day amongst a family of chimps, giving you plenty of opportunities to experience the chimps’ day-to-day life, and enjoy their antics. An early departure from Kibale gives you more time to enjoy the wonders of Queen Elizabeth National Park, as you drive south towards Bwindi Impenetrable Forest. The drive takes most of the day so you can enjoy your safari in search of the elusive tree-climbing lions, elephants, buffalo, Ugandan kob, and prolific birdlife. Arriving at the lodge in Bwindi Impenetrable Forest, you will be welcomed by friendly faces, a warm drink, and maybe even a family of gorillas that frequently pass through the camp! Every morning’s trek begins at park headquarters where you are assigned a family of gorillas. 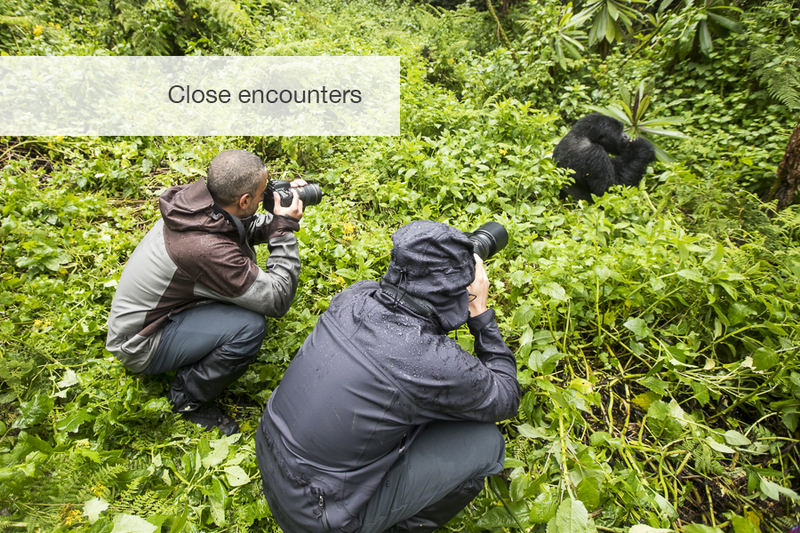 Once you reach the gorillas, you have an hour to enjoy their company and experience the thrill of such powerful and impressive animals. Depending on the duration of your trek, afternoons can be spent exploring nearby sights and attractions, including nature walks, meeting the Pygmy tribe or taking a tour through the local community. After a relaxing morning and sumptuous breakfast, you are transferred to the airstrip intimate for your charter flight back to Entebbe, in time for your onward travels. 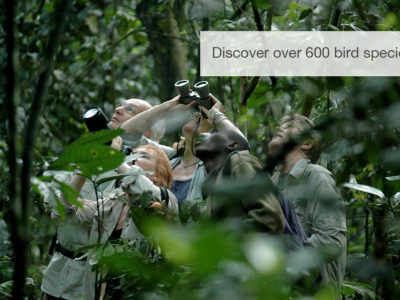 Gorillas, Chimpanzees, Black-and-white Colobus Monkeys, Red-tailed Monkeys, over 600 species of birds.